New book, Rescue Pilot: Cheating The Sea, by Jerry Grayson, AFC. A wonderful new book on more modern operations of the Royal Navy and the Fleet Air Arm. Covering the period from 1972 to 1980 Jerry Grayson describes his experiences as a helicopter pilot in the Fleet Air Arm on HMS Ark Royal R-09 and later in 771 Squadron as a search and rescue pilot. Jerry was the youngest helicopter pilot to serve in the Royal Navy and the most decorated peacetime pilot in naval history. This book should bring back a lot of memories for the many men who served with him. To read the first two chapters free click here. Click here to order in the U.K.
You can contact Jerry directly through his Facebook page. My father was in the the Royal Australian Navy and posted in the U.K. for a couple of years. I was born in Portsmouth and christened on board the Ark Royal in either 1958 or 1959. My name is apparently engraved on the ships bell. I would like to find out where the bell is so that at some stage I can take a photo, can you give me some information as to where the bell is being kept now. It was interesting to read the message from the lady in Australia who was christened aboard the Ark (R09), and enquiring about the whereabouts of the ship's bell. After the previous Ark sank off Gibraltar the survivors gathered on the quayside in Gib and voted that the ship's welfare funds be used to make a bell to be given to the next Ark Royal and so it came to pass that the R09 had the finest bell in the Royal Navy. It was too big to be hung on a bulkhead so it was hung in it's own plinth on the quarterdeck. Hopefully it has passed been passed on to subsequent Arks. Just been searching the web and just come across articles on this wonderful ship that I called home. I joined 809 squadron at RAF Honnington in Suffolk, on the 16th December 1974. Went to sea on several occasions with Ark Royal. I stayed with the squadron till 18th July 1976. I was asked to join ships company by a chief steward Ramsey. Who could say no to this fine ship. On the 19th July 1976 I joined Ark Royal as ships company. On joining I was told to go to 4v1 mess where I was met by the one and only George Hannan who was messman. Bunk space 2nd on the right, top bunk on the left. What I'm trying to do, is get in touch with any steward that served on Ark Royal between Dec 1974 to Nov 1978. It would be good to hear from George Hannan. I am looking for pictures of seamen aboard the Ark Royal in the early 1990s. Would anyone be able to help me with that? I am designing the opera SIREN SONG, which features the Captain and 2 seamen, and would like to be accurate in my representation. Thank you in advance for any information. 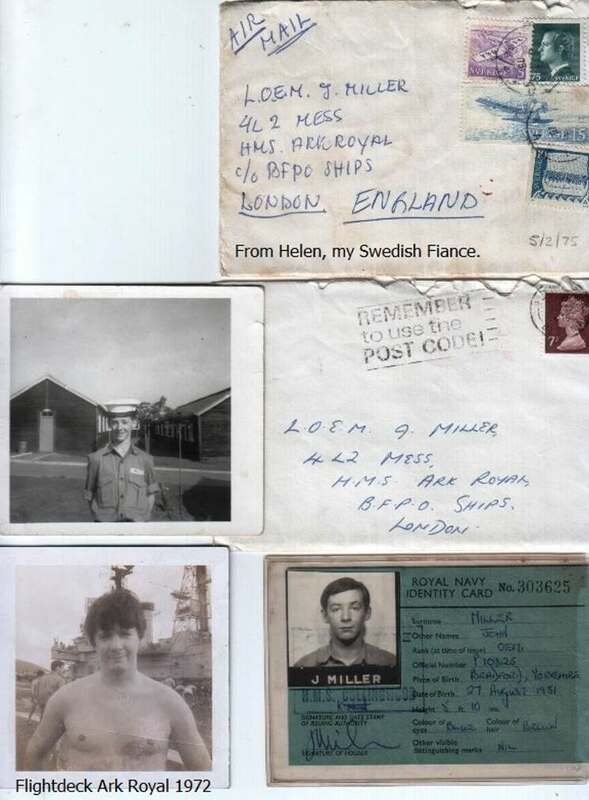 I was killick of 6 h2 mess in 1962 and have several photographs of my mess run ashore in Malta with all the lads in Chicos bar, if anyone is interest please email me. What a fantastic web site you have! I just came across it today. Awesome! I served on Ark Royal from 1972 to 1975 as a Leading Ordnance Electrical Mechanic, I left the Ark in 75 from Florida and flew back to the UK. Later that year I joined the South African Navy and served almost six years at Naval Logistical Command in Simonstown from Dec 75 till late 1981. I was in 4 Lima 2 mess on the Ark, I'm sending some proof so that you know it's all above board (see below). Excuse the pun! In one of your Guestbook messages, there is someone who has the original Officers Boat and has converted it. I have the original RN Ensign from that boat as I used to service it in 73 (I was the Battery King) I told my CPO at the time that “somehow” acid had damaged the flag beyond repair. I would like to contact the guy with the boat and give him the original ensign. I joined the RN at 15 in 1967, so have reached the ripe old age of 63. Although I have been in IT Software for over 30 years and have owned my own Company since then My passion now is that I have designed a host of green building products in South Africa, (since I retired at 55 and where I live today, Sandton, Johannesburg). I joined the Ark in Cammell Lairds in 1955 and served on her until 1958. The photo of Ark Royal and the Mayflower bring back happy memories of the trip to Norfolk, Virginia, USA. I have a copy of that photo in my album. We were in Devonport and saw the Mayflower sett sail for the States. We left sometime later and in mid Atlantic we met up with the Mayflower. We offered them fresh provisions and water etc but they refused any assistance. We carried on to Norfolk and were there to watch the Mayflower's arrival. The reason for the trip was to take part in a fleet review to celebrate the landing of the Pilgrim Fathers. I am now 81 years old and have lived in New Zealand since 1966. Jack Finegan, L.M.E & P.O.M.E. I was the sailmaker on board the Ark Royal from 1962 -1977, served with John Colcugh. I was the last professional tradesman Sailmaker to leave the RN, I joined at St. Vincent in 1952, and began training as a sailmaker when I became 17. I was in 5 C2 Mess. right under the flight deck. Then back again from 1977 till 1980, same mess. Some of us from 5c2 have got together, do you remember Richard Manning, Phil Hadfield, well send an e mail and join us. remembering times gone by. My dad served on the Ark Royal not sure of the years, but he has a photo album full of memories his name was Paul Brown think he was a aircraft engineer. I am trying to contact a Howard Francis Claytor, believed to have served on HMS Ark Royal R-09 during the 50's. His daughter and grandchildren would love to meet him or any relatives. "Mar. 27, 2017: Just a quick message to say Thank You for forwarding this email on to me. Since receiving this message my mum has now met her half sister for the very first time after many years of searching for her. They were both extremely happy to have found each and I realise this wouldn't have been possible without your website. Thank You again." Sharon Bovingdon looking for father Howard Francis Claytor relitives, my father's name is the same and I believe I have a half sister. I have been told by family that my Uncle Donnie (Donald Fred Damerell), served on the Ark Royal. I'm assuming in the period of the 60's. I have been unsuccessful in finding any confirmation of this. I am trying to write a social history of my family. So if anyone can confirm and share memories (and photos if any) of my Uncle, I would appreciate it. I was in 4r2 mess from during the last commission in 1978. I would like to hear from anyone who remembers me and would also like to see any photos of the catering dept from 4r2. Could you please let Tony Gale AKA Windy, know that I was a leading steward on board Ark Royal when he was on her. Do you remember Ken Simmons who was in the wardroom bar, Nigel Walker and Bob Briggs. Also at the time chief steward Ramsey (Jock). I served on Ark from 1964-1965, on leaving Fremantle I flew from ship on compensate leave [father dying]. Looking for air craft handler Bill Widerfield or Widerson from Sunderland. I was an aircraft handler, here's hoping. I would also like to reconnect with some guys from the flight deck crew like leading airman Titch Richardson, airman Mike Honeywell from Swindon and Bill Widowfield or Widowson from Sunderland. I am trying to find two sailors who served on the HMS Ark Royal in 1978 when they were in port at Mayport in Jacksonville Florida. Their names were Ian Forsyth and Richard Dante. My name is Frances Baker. I would love to know how they are doing. If you could pass on to Anne Sutherland that I could be the Harry Harrison she is looking for as I was on the Ark at that time. My father is Brian David Hughes, he served as a Chief Petty Officer on the Ark Royal. I was christened on the Ark in 1961 and still have the original certificate. I recently found out that the names of the children christened on the Ark were engraved on the Bell, and was wondering if there is anything you can tell me about the bell as I know that the Ark was scrapped. A photo/image would be great if it is available. Dad has passed now, but he was always proud of serving on the Ark Royal. I served on HMS ARK ROYAL from 1964 until 1966, by the way she spent Christmas in Fremantle in 1965. I worked on the starboard catapult, launching Sea Vixens, Scimitars, Fairy Gannets and Buccaneers Mk 2. I remember going through the Suez Canal summer of 1965 and stopping off in Aden during the troubles. I have a copy of the Three Ark Royal's 1938 -1999 by Neil McCart, worth having from fan publications. Me and Neil joined up together at HMS GANGES in October 1961, we re-connected in 1996, through the 'HMS Ganges Association'. MY time on the Ark was memorable, she seemed to spend a lot of time along side especially with the boilers breaking down, our sister ship 'Eagle ' seemed to take up the slack. I am emailing for my father in law, Tom (Dimpy) King. He is looking to contact any one who shared a drink with him. He served from 1964 to 1966 on the Ark Royal. Please get in touch if you have any info. My Daughter was Christened on board HMS Ark Royal on 23rd August 1970, while I was serving on the 4th Ark Royal, her name should therefore be in the "Ship's Bell". My Question is: where is the bell now she has paid off? I live in Australia and will be coming back to the UK and would like to take a photo of her name in the bell for her to keep. If anyone can help, I would appreciate it greatly. I don't know if you can help me, but I am looking for ex Ark Royal air department colleagues who served on the Ark in 1964. I have in one of my reception rooms a 4 foot model of the Ark Royal which was built by the air engineering department. The detail is fantastic and every bit of this model is hand built. I found some old pictures (see below) of my time on the Ark 1964 to 1966. These were taken in the Indian Ocean around Jan. 1966 I think on our way to Mombassa from Fremantle to take up station for the Biera patrol after Rhodesia had declared independence. The line up of 9 guys, I am second in from the right, back row. The guy on the end right is John Gardener from London, I can't remember any other names. 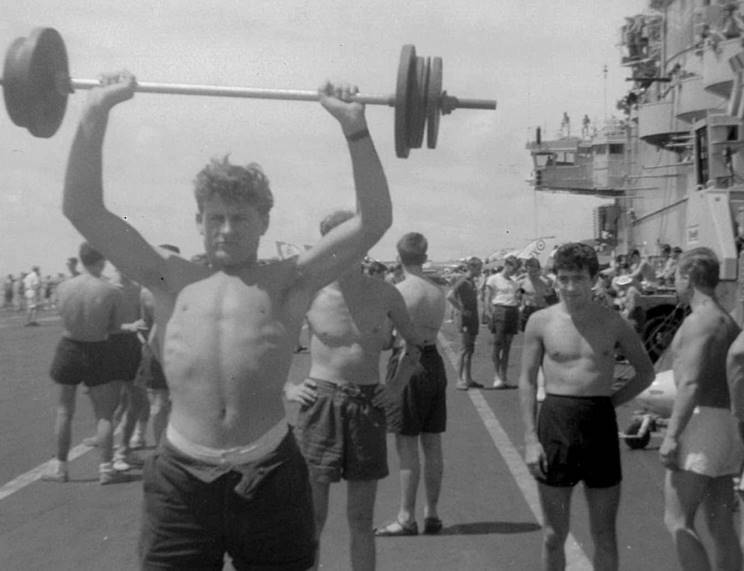 I am the weight lifter, can't remember any of the other chaps in the background. 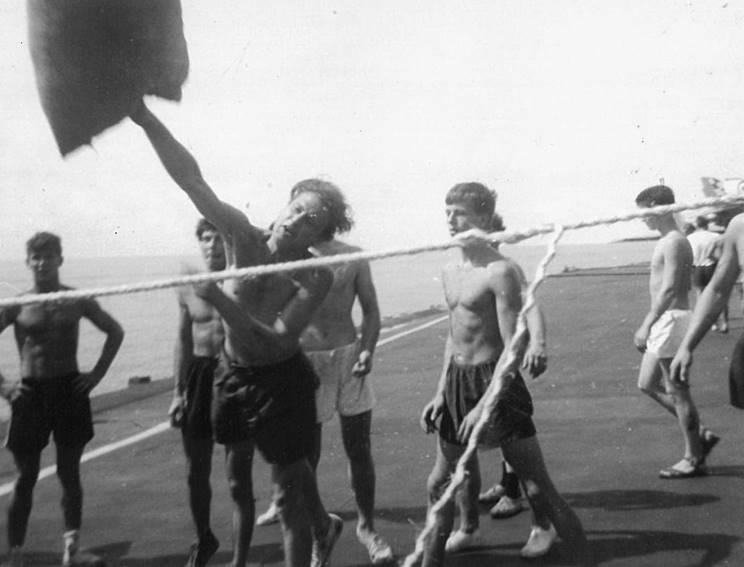 The picture of the guy throwing the bag over a rope is Leading Seaman "Wiggy" Bennett, seaman dept. don't know the rest. In the photo of the 9 denizens of 6H2 mess (top photo) waiting to RAS on the flight deck, I am second left in the back row. The guy second left in the front is John Nelson, I think the bloke next left is Barry Smith? My name is Ged Smith, I left the mob in 1979 as a PO(RP1) Nelly changed branch to be a CD, He was working in the Red Sea after the first Gulf War clearing ordnance from sunken vessels, whilst on leave he suffered a massive stroke. He was left wheelchair bound and robbed of speech except for one word F***!! Which just about sums up my outlook on the world at the moment. Get in touch Keith if you want to swing the lamp. I am the very proud daughter of Ronald (Bob) McEvoy, who sadly died on Saturday. He was 75, born in Liverpool, and had served aboard the Ark Royal many years ago. Although he told us tales of his time in the Navy, I haven't a lot of information and no photographs. I would appreciate, more than I can say, any info, stories, but mostly photos, if anyone can help. I am trying to find information on my mother's brother, with whom she lost touch more than 50 years ago. He served on HMS Ark Royal in the 1950s, and became a Petty Officer specialising in radio communications. His name was David John Pratt, and we know that by 1962 he had left the Navy. Any information on him would be greatly appreciated. I served on the Ark Royal (RO9) for a year – the whole of 1960 I believe. I was one of five Army personnel attached to the ship, and two of us messed in 2T1. I still have several photographs and other items relating to the ship at that time and would be very happy to send copies of these to anybody interested. Previous to this I was stationed at RNAS Lossiemouth for a year, but only have a few personal photos taken there. Would also like to share memories with anybody who happened to be there around those times. I am looking for any information regarding an uncle who served on the Ark Royal as a Royal Military Police Officer. His Name was Ronald Johnston d.o.b. 22-04-1932 in Liverpool, and the family believes that he was serving around 1950-1955. He died in 2004 and left me his military tie that is navy blue with a gold pin stripe and lots of white kangaroos and lions all over it. Can you tell me, are there any records of the people who served on the Ark Royal and the places and conflicts in which they took part?